The raison d'etre of the new company Poitras, Greenwald and Scahill created in partnership with Omidyar called The Intercept (First Look) was for Omidyar to finance the herculean effort of responsibly releasing the Snowden documents. To date, however, once Omidyar got control of the goods around October 2014, only a trickle of the Snowden archives has seen the light of day. The remainder of the digital documents are in dire danger of never being released -- or worse, being destroyed, accidentally or otherwise. Remember, from June of 2013 when the Snowden event happened to late 2014, for weeks on end all we heard about were the Snowden docs, with one side saying they're a violation of national security, and the Greenwald/Poitras side championing the right to whistleblow state secrets. Since the very beginning, my sister Colleen and I have wondered what manner of subterfuge has been going on with Greenwald et al. For a long time now, a few brave critics have raised serious questions about Snowden, Poitras, Greenwald, Scahill, and Omidyar to the ire of indignant leftists who deem them all sacred cows immune to criticism. With the arrest of Julian Assange, Greenwald has rightfully spoken out in strong opposition to the extradition. Nonetheless, it is the height of unseemly opportunism when Greenwald sent the attached email on April 11 to The Intercept's readers bemoaning Assage's arrest. . . and then asking readers to support free speech by donating -- not to Assange's legal defense! -- but rather to the already richly-endowed Intercept, the very organization that is abandoning the valuable assets entrusted to them by Edward Snowden, another besieged whistleblower. Further worth noting is Greenwald's interview with NPR on April 11, the day of Assange's arrest in which in a tweet Greenwald claims the interview "became contentious" when NPR characterized him as a "colleague of Julian Assange." Why on earth would being a colleague of Julian Assange offend Greenwald? Marcy J. Gordon My friend Cat McGuire’s commentary and analysis may be of interest to readers on this list. I’m pleased to announce that “On the Brink of Armageddon: LBJ, the Six-Day War, and the Attack on the U.S.S. Liberty” is now available as an ebook on Amazon’s Kindle and B&N’s Nook for $2.99. Amazon also offers the first few pages on its “Look Inside” link. 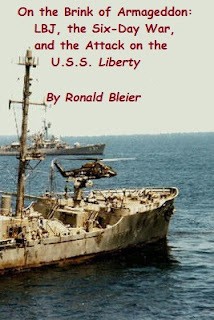 "On the Brink of Armageddon" highlights the theory outlined in a book by BBC documentarian, Peter Hounam: "Operation Cyanide: Why the Bombing of the USS Liberty Nearly Caused World War III." From Hounam and others it can be inferred that President Johnson masterminded both the Six-Day War of 1967 and the Israeli attack on the Liberty. The latter operation was planned as a false flag attack, not unlike Johnson’s Gulf of Tonkin hoax, this time to be blamed on Egypt. It seems that President Johnson hoped the sinking of the Liberty would serve as a pretext to join Israel’s war. The work of Stephen Green in the 1980s, principally his book, "Living By the Sword: America and Israel in the Middle East," revealed that the U.S. was deeply involved in Israel's war and must have been colluding with Tel Aviv for many months before June 1967. “On the Brink” details some of the evidence supporting Hounam’s incredible theory that LBJ planned to initiate World War III with the bombing of a Soviet air base near Cairo with a nuclear-tipped weapon. In the end, Cairo was spared the intended nuclear attack when the USS Liberty miraculously somehow escaped from its intended fate.